This was our first face-to-face with Dr. Pornchai (Tirakitsoontorn) since Rudy’s failed sleep study, so we were eager to hear his opinion on where to proceed from here. We didn’t go in with high expectations–it became clear on our last visit that there isn’t really any therapy or drug out there that would help Rudy’s lung function and most of his recent consults have basically communicated the same thing–Rudy’s stable, but there is no plan–there’s just no way to address anything and move “forward” in his current condition. The failed sleep study seemed to take one of the only remaining steps forward (removing the trach) off the table. So it surprised us to hear Dr. T share that he’d like to give Rudy another turn and repeat the sleep study in about two months. 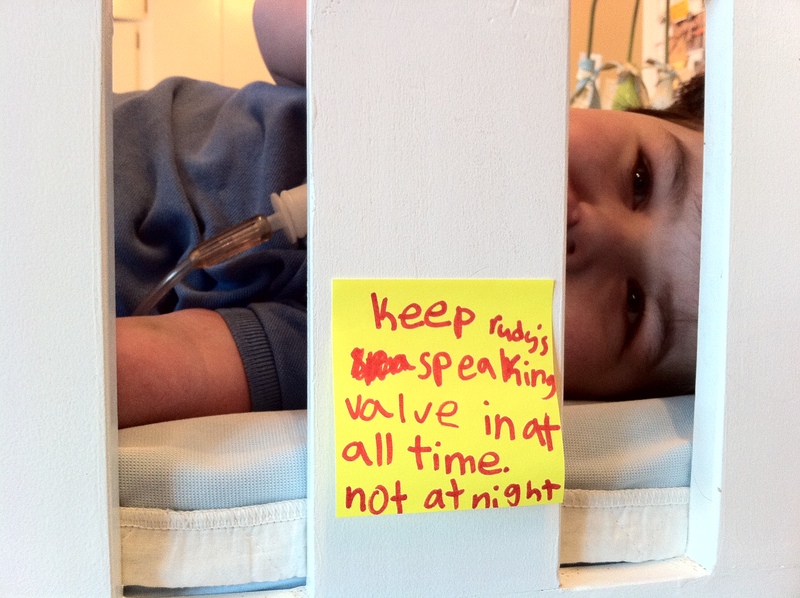 The sleep study showed that Rudy was breathing from his stomach too much and the effort required caused his heart rate to elevate too much when the trach was capped. 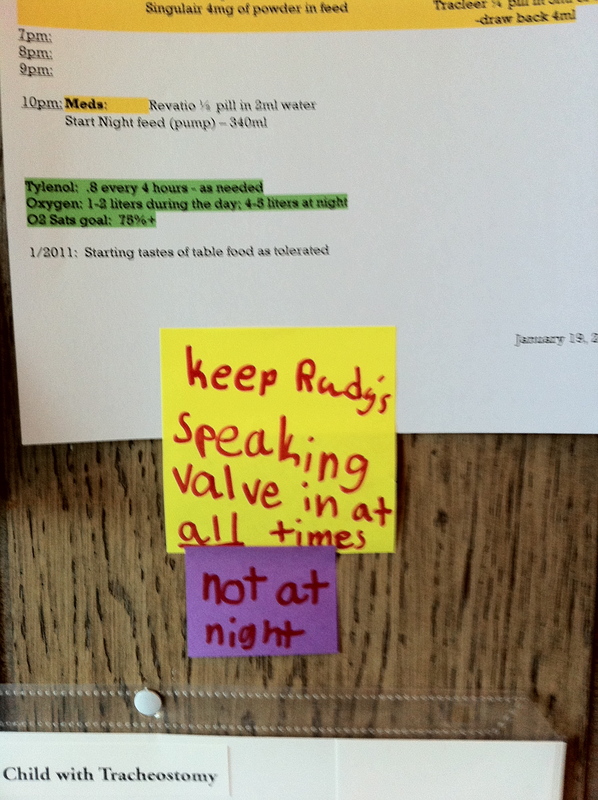 He’d like Rudy to use the speaking valve all day (which allows him to inhale through the trach but exhale through the upper airway) to see if this helps him over the hump. I’ll head back down to UCLA with Rudy next Wednesday for an appt. with Dr. Shapiro (ENT). As we’ve had those challenges with the trach coming out, we want to get her to check things out…so, we’ll take it easy this weekend and continue to enjoy the great weather we’ve been having. Thank you for your concern and prayers!! Super helpful Olivia posted reminders before she left for school! Looking forward to hearing Rudy worship his Creator! So glad you had another safe trip to UCLA. God continues to provide life and hopefully further development of the pulmonary function. One more voice added in your household gives Rudy a chance to command attention. Heads up, everyone! Much love to all. Let the whole earth praise the Lord! Excited to have Rudy joining in in the praising on Sundays. LOVE Olivia’s reminders! so wonderful. Yaay Rudy!!!! Get loud! So glad to hear your upbeat report from Dr. T. It’s nice to have something to be working toward, even if it is not the ultimate solution. Perhaps some earplugs would be in order for your birthday present this year!? Awesome news – ready for some joyful noise, huh, Rolf? Fun!Fun!Fun! That means no working at home Uncle Rolf. Maybe you should feed Rudy some Duck, Oregon Duck is the best. Those who eat Oregon Duck always win! Especially if you stand with Cam. I remember those “voice-less” cries Rudy made UCLA during those early days….was so fun to hear his vocalizations last time we saw you! That said, I’m sure his attempts at matching the Geyling noise level require extra patience. Looks like Olivia, for one, is supporting you in this effort!! Love yous…. Really looking forward to hearing Rudy rock the house! So glad that progress is still being made. Lung Power Rudy!! !